In a state media broadcast Wednesday, Venezuelan dictator Nicolás Maduro alleged that “at least one million” civilians participated in an obstacle course organized by the government and branded “Bolivarian Sovereignty Exercises 2017,” meant to train civilians for war with America. The “training” included swinging on ropes, running through tires, and crawling in sand holding weapons. Venezuela’s socialist regime announced the exercises this weekend in response to President Donald Trump suggesting that a military option to rid Venezuela of Maduro’s regime was on the table for the U.S.
“I want to extend my recognition, my congratulations to the National Bolivarian Armed Forces (FANB) for their Bolivarian Sovereignty Exercises 2017, to the people and the civic-military union,” Maduro said on Wednesday from his palace in Caracas, asserting that “over one million combatants” participated in the exercises. “I was perplexed—even though I know very well what we have, when you see it deployed, you say ‘Chávez planted seeds in fertile ground and left us a powerful national armed forces … a peaceful military,” Maduro continued. The exercises would allow the government “to install a new doctrine, new strategies for security … thanks to Russia, thanks to China, and thanks to our military industry, which has come to take up an important space here—we have a military industry!” he continued. 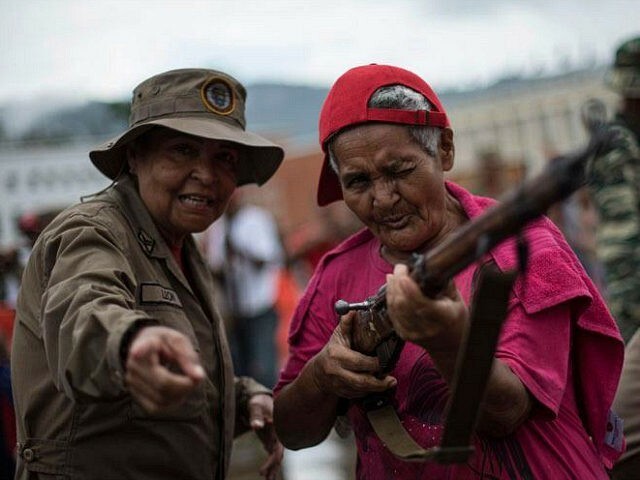 The Venezuelan television network VTV broadcasted scenes from the military-civilian exercises, showing a number of older Venezuelans forced to engage in obstacle course games to prepare for an American invasion. “It is impressive how the people of Venezuela have mobilized and this is a positive sign regarding the people’s capacity to respond, how the people feel about their nation,” Defense Minister Vladimir Padrino López said that day. Local media reported at least one death, as a middle-aged man suffered a heart attack while engaging in the exercises. The exercises were the latest attempt to militarize the Venezuelan population, in an attempt to intimidate dissent and prevent mass uprisings as a result of a developing famine and near-total shortages of medicines and basic necessary goods. In April, Maduro announced that he would distribute over 400,000 firearms to his supporters, vowing “a gun for every militiaman” despite the socialist regime’s blanket ban on gun ownership for law-abiding civilians. The nation’s Supreme Court, also controlled by Maduro loyalists, approved the law. “It is about time to make the law count and allow reason and justice to rule,” Chief Justice Maikel Moreno declared.